Learn a new geography definition each day covering physical geography, human geography, applied geography, and cartography. To receive a daily email with the geography concept of the day, fill out your email in the box below. 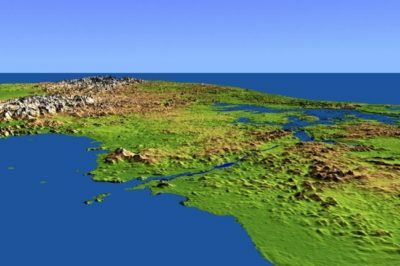 Shaded-relief map showing the Panama Canal with the Pacific Ocean in the foreground and the Caribbean Sea in the distance. Source: NASA. An isthmus is a narrow strip of land connecting two larger land masses which is bounded by water on two sides.